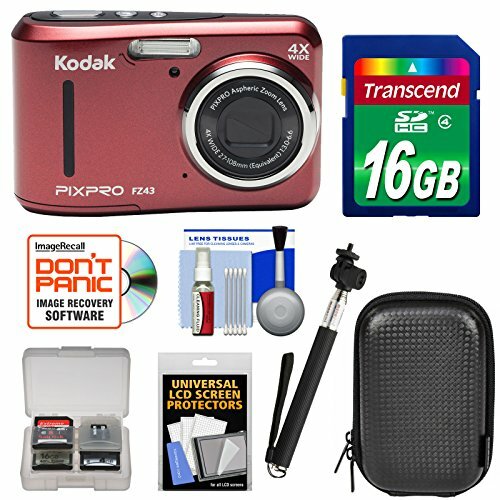 The KODAK PIXPRO FZ43 Friendly Zoom Digital Camera is the perfect camera to take anywhere you go. One-touch video, red-eye removal, face detection and AA batteries are just the start. Thanks to the 16MP CCD Sensor, you can capture pictures with real life beautiful clarity and contrast. With a 4x Optical Zoom, the FZ43 can get you right in the middle of the action. Capture everything without having to take a step back with the 27mm wide-angle lens. Make 720p HD video and view your pictures on the 2.7-inch LCD screen. Take more high-resolution pictures faster (4MB/sec. minimum) with this 16GB High-Capacity SecureDigital (SDHC) memory card. The Sunpak SP-BSW-BK Selfie Wand is the ideal way to extend the reach of your selfies. Mount your smartphone, GoPro, action camera, or point & shoot camera onto the wand, extend the wand to your desired length (up to 42 inches), and enjoy the results! This 5-piece cleaning kit contains everything you'll ever need to properly clean your lenses, including Lens Cleaning Tissues, Lens Cloth, Lens Cleaning Liquid, Blower Brush and Cotton Swabs. View More In Point & Shoot Digital Cameras. If you have any questions about this product by Kodak, contact us by completing and submitting the form below. If you are looking for a specif part number, please include it with your message. © 2019 - eisf.org. All Rights Reserved.